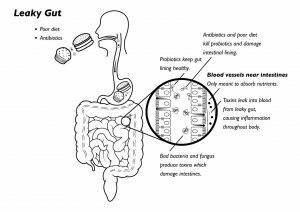 The theory is that leaky gut syndrome (also called increased intestinal permeability), is the result of damage to the intestinal lining, making it less able to protect the internal environment or filter needed nutrients and other biological substances. As a consequence, some bacteria and their toxins, incompletely digested proteins and fats, and waste not normally absorbed may “leak” out of the intestines into the bloodstream. This triggers an autoimmune reaction, which can lead to gastrointestinal problems such as abdominal bloating, excessive gas and cramps, fatigue, food sensitivities, joint pain, skin rashes, and autoimmunity. The cause of this syndrome may be chronic inflammation, food sensitivity, damage from taking large amounts of nonsteroidal anti-inflammatory drugs (NSAIDS), cytotoxic drugs, radiation, certain antibiotics, excessive alcohol consumption, or compromised immunity. Our Gut Flora program or our 21 Day purification program may be the answer that you have been looking for.